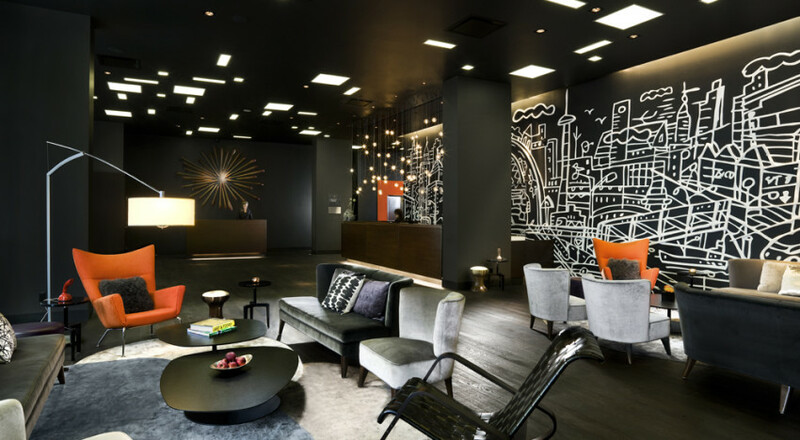 Located in the heart of Toronto’s most popular district, King West, you will find the cool, luxurious Thompson Toronto Hotel. 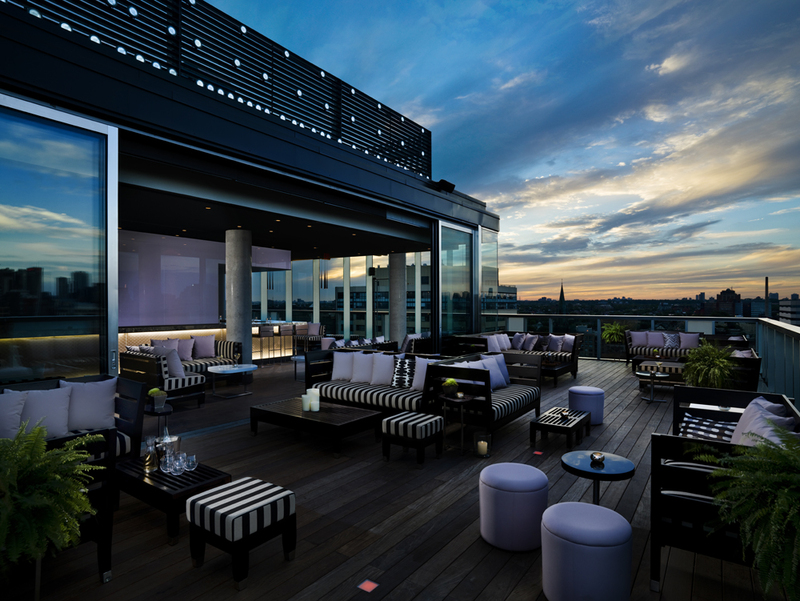 This upscale venue founded in 2009 features works by renowned artists along with an exceptional rooftop lounge that has the best, breathtaking 360-degree view of the city. It’s a popular place for celebrities, tourists looking to get a taste of the local culture and a top choice for Toronto Film Festival and Fashion Week attendees who want to be close to the action. 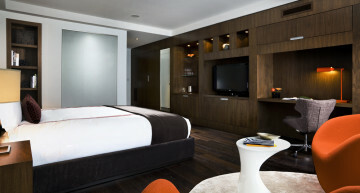 Whether you are in town for business or for pleasure, the Thompson Toronto Hotel offers some great spaces and amenities. These include free wifi access, a business center, screening room, various event spaces, an exclusive 40-foot rooftop infinity swimming pool complete with cabanas, a 24-hour gym and an ultra-chic underground nightclub. Rooms open to floor-to-ceiling windows, boasting amazing views of the cityscape, skyline and Lake Ontario. These window walls are complemented with dark hardwood floors, contemporary furnishings and an airy atmosphere with contrasting accents in rich orange and cool white. Also within the hotel, guests can enjoy meals at the upscale 24-diner (rumored to serve an outstanding burger), as well as the brand new The Colette Grand Café, which offers fine French cuisine. These delicious eateries are appealing, especially in the coldest of winter months when venturing outside can truly be a chore. Nevertheless, those looking to explore the area outside the hotel and discover fun activities need not travel far. 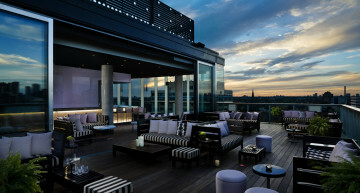 The Thompson Hotel is centrally located in the spot to see and be seen, with some of the city’s hippest restaurants and clubs. 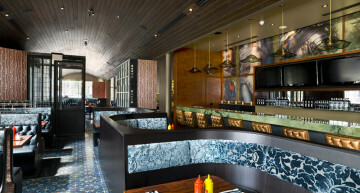 The top three recommended restaurants nearby include: Blowfish Restaurant & Sake Bar, Rodney’s Oyster House and Lee Lounge. You’ll find Trinity Bellwoods Park located near Queen West, which offers free tennis court access. It is a popular hangout for hipsters and a place where you can have pizza delivered to you in the park. Local favorite bar/restaurants in the vicinity include Milagro, Czehoski and Terroni, while cool coffee shops include White Squirrel and Sam James Coffee Bar. The neighborhood offers a ton of eclectic art galleries and shopping experiences — some fun things to try. Between Spadina Avenue as far as Trinity Bellwoods Park and south of Queen Street is Toronto’s Fashion District. It has become a hub for small (but some of the best) home furnishings stores, offering anything from high-end custom designs to modern, retro and vintage items. Going more couture, Toronto Fashion Week generates quite a buzz in the city every March and October. 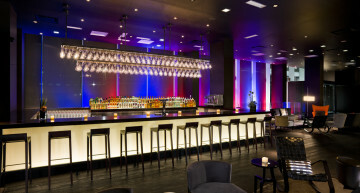 The Thompson Toronto Hotel is a great place for traveling industry personnel. From here, it is just a five-minute car ride or fifteen-minute walk to the main show venues.